Before we dive into the What is a Blockchain? infographic, let me first explain why I created it. Or, you can simply scroll down to the infographic and bypass my incredible words of wisdom. Words of wisdom that have surely never been typed before…anywhere, ever. I frequently take on new tasks, both personally and professionally, blatantly involving pieces and/or processes that are outside of my current skillset. Why would anyone do this? Because I want to cram as much information into my brain as humanly possible before I can’t cram it in anymore. What if you suddenly became incapable of learning? Wouldn’t you miss the option to be able to do so? I know that I would. If you’re able to learn something new and/or grow your skillset, why in the world would you choose not to? I think we can all agree that at times learning a subject or a process is a breeze, other times, not so much. The point I’m really getting at here, is that with no prior experience in the solutions industry, I’ve had to work through the challenges of learning a plethora of products and services that I was completely ignorant to less than a year ago. Without diving into my feelings too much here, I can tell you there have been headaches, tears, and even points where I was fairly certain that my brain was so crowded and overworked that it just up and left the building. However, after the chaos has settled from the information warriors battling their way into the crevices of my brain, the satisfaction of the new knowledge and how it applies elsewhere is indescribable. That satisfaction holds especially true for me in the solutions industry. Our industry is packed with relevant, exciting, world-changing information that spans across nearly every other industry, and I feel so lucky to play even a tiny part in that. 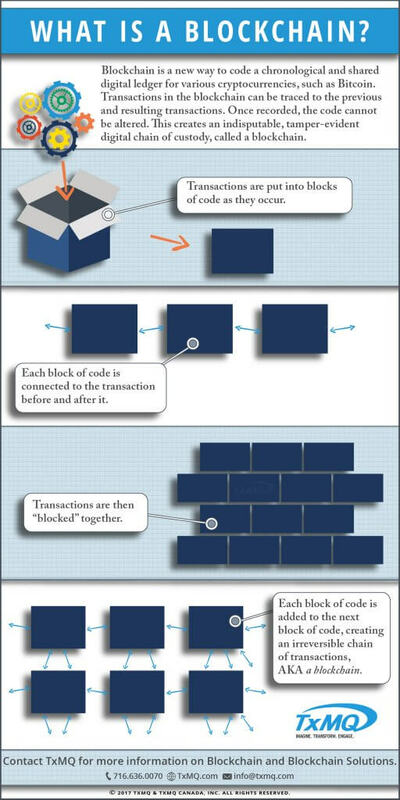 I created this blockchain infographic to better understand what a blockchain is, while reading Chuck’s post: How much do you know about blockchain and is it just hype? I find it easy to dive into a good book and paint an entire world of characters in my mind; but nothing helps me grasp intangible objects quite like a visual. So, if you’re struggling with the concept of blockchain, my goal is that this visual will help you in the same way that it did for me.